During our seven years operating throughout Greater London, we’ve built up a wide knowledge of the areas architecture to regularly work with homeowners who want to achieve their dream home. Our knowledgeable team have experience in a range of home improvement project solutions including, integrated blinds for no-hassle light control and aluminium windows which never fail to provide impressive views of the outside. With windows and doors from Keepout you can be sure that your home will be left looking just as traditional or contemporary as you’d prefer. 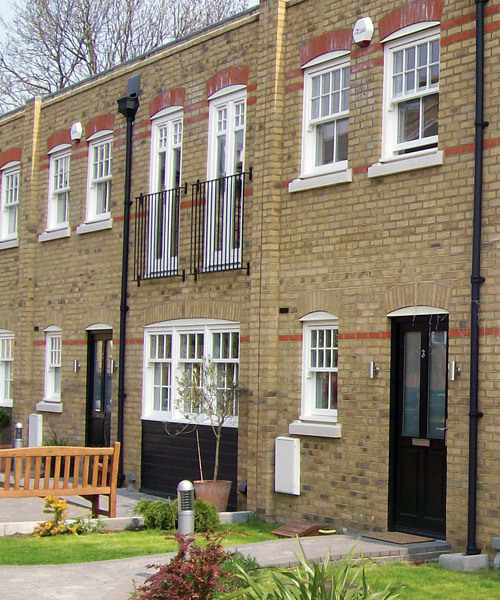 Unlike most rival companies present in the area, we offer products in uPVC, aluminium and timber to provide homeowners with as much choice as possible. Have an irregular aperture or desire? Our double glazing solutions can be tailored to you. Keepout are proud to offer a wide selection of double glazing products in various beautiful materials that we aim to install swiftly and to a high standard. You can be assured that every window and door we supply easily exceed the required energy efficiency standards and are surprisingly low maintenance. Just sit back and let the products do the work! Vertical sliding windows, bifolding doors and even integrated blinds, our eclectic range of products are sure to keep any style of home comfortable and cosy – even during the winter! Whether this is through innovative weathertight sealing, triple glazing options or the simple implementation of a composite door, the latest thermal technology can always be implemented. Why choose Keepout for your home improvement project? Our high calibre of work was awarded back in 2014, winning the FIT show’s prestigious 2014 ‘Master Fitter’ award – so you can be assured that when opting for double glazing solutions from Keepout, it’s an award winning service.